This week brought a reminder of how difficult it is for a bill to become a law. Yesterday was the last day for the Senate to vote on bills approved by the House and the last day for the House to vote on bills approved by the Senate – not counting bills tied to the budget. It was a good time to pause and look at how many bills survived the process. Of the Senate bills introduced this year, 15.5% were approved by both the Senate and the House. The success rate is approximately the same for bills that originated in the House. In other words, for every 20 bills introduced, just three earned approval from both the Senate and the House. Click here to listen to my latest interview with KOHO radio, about my prime-sponsored bills and the transportation budget the Senate adopted last week. Between now and April 23, the end of our 105-day regular session, we have just two things left to do. One is to look at changes made to Senate bills by the House and decide if we agree – or “concur,” in legislative language – or want to dispute the changes. The other is to reach final agreement with the House on the operating, capital and transportation budgets for 2017-19. 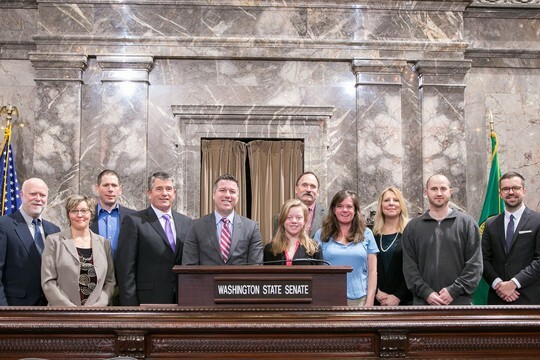 Representatives from Chelan County and the Wenatchee-based Wildlife Project visited Olympia earlier this session. We had a great discussion on forest health with the Commissioner of Public Lands and enjoyed a lunch together before visiting the Senate chambers. I am very thankful that my Senate Bill 5546, a locally-inspired forest health bill, was approved by the House this week. This bill was one of my top legislative priorities for 2017. It directs the state Department of Natural Resources to set up a framework for assessing the health of fire-prone lands and treating them. It sets a specific goal of assessing and treating 1 million acres over 16 years, most likely through prescribed fire and mechanical thinning. The bill also includes a stakeholder process and biennial progress reviews to the Legislature. Through their votes, the Senate and House have made it apparent they see forest health as important and very necessary to reduce our risk of massive wildfire. It is great to see that what began as a community conversation in the wake of the “megafires” of 2014 and 2015 has clearly become a legislative conversation. The Governor’s signing of SB 5546 is not yet scheduled, but I look forward to inviting the many stakeholders who helped make passage of this bill possible, including committed local leaders, the Department of Natural Resources, the Nature Conservancy, Washington State Forest Protection Association, and others who came to Olympia to advocate for this change. A budget appropriation linked to SB 5546 is in the Senate budget, and I anticipate it will carry through to the final agreed-upon 2017-19 operating budget. 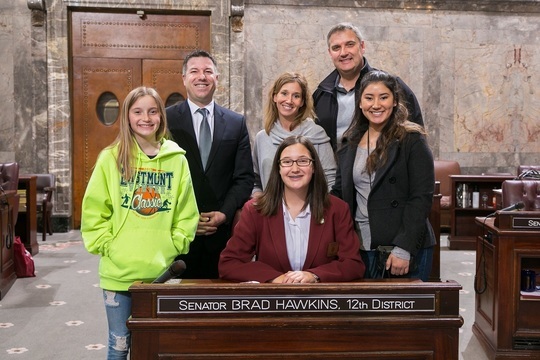 I was very honored to have Madison Piepel serve as my Legislative Page last week. Madison is a 9th-grader at Eastmont and the daughter of David and Tracy Piepel of Wenatchee. She did a wonderful job, and I enjoyed spending some quality time with her family as well when they visited.